Flew with Ryanair from Stanstead to Brno. Fairly painless and arrived into Brno on time, through passport control, picked up my bag and I was waiting for the bus into town about 10 minutes later. The last time I visited Brno it was pouring with rain- this time the weather was much more pleasant- and not the scorching temperatures of the week before which I had thankfully missed. I was pleased to see that there were still some 242 locos pottering around, I would say just under 50% still wearing the old red/cream livery. The 242's mostly seemed to work the trains to Breclaw and Vranovice. I went for a spin with 242 247 to Rajrhad on a Vranovice train, returning with 362 165. I then headed into town for a wander and to photograph some of the many trams (including old Tatras)- I could happily have stayed in Brno for dinner as it seemed a lovely city- but I had to get back to the station and make my way to Bratislava to meet my companions for the rest of the trip. 242 214 approaches Rajrhad with a train to Brno. livery such as 362 019. 380 015 was the power for the 20:21 Euro City (which was annoyingly 35 minutes late). The journey into Slovakia was uneventful, but it was very noticeable upon crossing the border how much more graffiti there was and that Slovakia generally had a look of being a poorer country. By the time I had been delayed, checked into my hotel and enjoyed a very nice kebab for dinner it was 23:00 before I met my friends for some drinks in the old town of Bratislava. We awoke to a sunny morning in Bratislava and before long our first freight had turned up- A Siemens Eurorunner E189 845... well that isn't what I came here to see! Bratislava's main station is a great place to watch the trains and quite busy. I was particularly keen to catch some class 240's and this didn't prove to be difficult with one stabled in the middle of the station and several others appearing. We went off for a ride with 240 139 towards Trnava (unfortunately on air-con coffins, but we didn't have a lot of time to hang around). A half hour break was taken at Svaty Jur during which a few trains were seen including a long automotive train with 363 099 at the helm. 381 001 was the traction for our return trip to Bratislava. A few more trains including a MAV M41 were photographed before we began to make our way to Komarno around lunchtime. 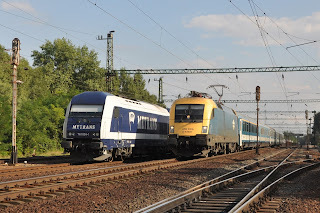 380 019 was the power for our Euro City to Nove Zamky where a tight connection was made onto a double deck unit (no 240 then) on to Komarno. A very pleasant lunch was enjoyed on the Euro City- the first of many on-train meals over the next few days. Rail Trans International 242 557 was stabled on a train at Komarno but with no other obvious activity it was time to leave the station and start the walk over the Danube to Komarom. There was a nice surprise waiting at Komarom- Bobo TFT's 'Goggle' 468 001 sitting outside the shed.A few more trains were photographed at Komarom before a Flirt unit was taken on to Gyor Gyarvaros. Only two freights were seen in the short stop here, the first a trip working between yards handled by DB 0469 112 and the second by DB Romanian 'Phoenix' loco 91 53 0417 002- quite a smart looking machine. 418 311 was seen on the 15:45 to Veszprem followed by 418 164 on the 16:03 to Celldoemoelk. This was taken to Gyoerszemere where my first minor disaster of the trip occurred. I jumped off for a photo while my friends continued a few stops further- the plan being to meet up again on the next train back up the line. Only it didn't stop where I had got off! Having had a similar problem earlier in the year in France I was really determined not to muck something up like this, but I had and was now due to be stranded for the next hour and a half. As it happened this did ultimately work out quite well for me as 418 140 made an unscheduled stop on the 16:40 Gyor to Celldoemoelk (ex Budapest) to be passed by the train back to Gyor (the one my friends were on, with, I believe 418 312). It didn't help re-unite the group but it got me back on a train, another original engined M41 as well. The only sensible move was to take this for a decent run down to Papa to pick up the next train back up the line. On arrival 418 108 was sitting in the opposite platform on Gysev coaches ready to take the 16:50 from Celldoemoelk back to Gyor- another decent run with a 'real' M41. At Gyorszabadhegy we paused for 628 319 to pass with a rail train. 418 309 was also seen pottering around at Gyor on the return. 418 140 smokes away from Papa with a train bound for Celldoemoelk. My friends had taken the 18:20 IC back to Budapest leaving me to follow on the 19:20 Railjet from Gyor with 1116 208. I didn't have time to buy a res as the que was huge. I approached the gripper to buy one to be told that I couldn't. That sinking feeling of 'oh' was just about to set in when she then said 'but it's ok there is plenty of room over here'. Excellent. Last time I arrived at Budapest Keleti in 2012 the entire area outside was a building site. Now it resembles a refugee camp- a sad reminder of the current migrant crisis in Europe. Today has a beautifully simple plan- ride the Nohab and M62 on the heritage trains around lake Tapolca. We opted for the later start taking M61 017 on the 09:40 departure from Deli. At least it should have been. We arrived in plenty of time to find the MAV Nostalgia stock, but no loco. By departure time there was plenty of activity around the train- just one problem. No loco. Having almost given up on the entire day the Nohab eventually did turn up- about 90 minutes after departure time. The train left around 11:15, just behind the 11:05 service to Tapolca- not a lot of normals on board then! M62 - 628 265 waits for it's passenger turn in at Tapolca. The Nohab was great fun and lunch in the dining car very satisfactory- though my second major error of the trip soon surfaced- I had left my interail in the hotel! Oops!. Despite being cloudy almost all day we arrived at Tapolca in a patch of sun and got some photos of the run-round. The train being so late arriving there was just time to shunt the dining car on to the other end of the stock, run around and head off again, the return train to Budapest leaving some 15 minutes down. We rode the Nohab back to Badacsony before a quick look at the lake and then picking up 418 331 back to Tapolca. 628 265 put in a decent performance on the M62 turn. Heritage M41 2143 was passed at Balatonfured. 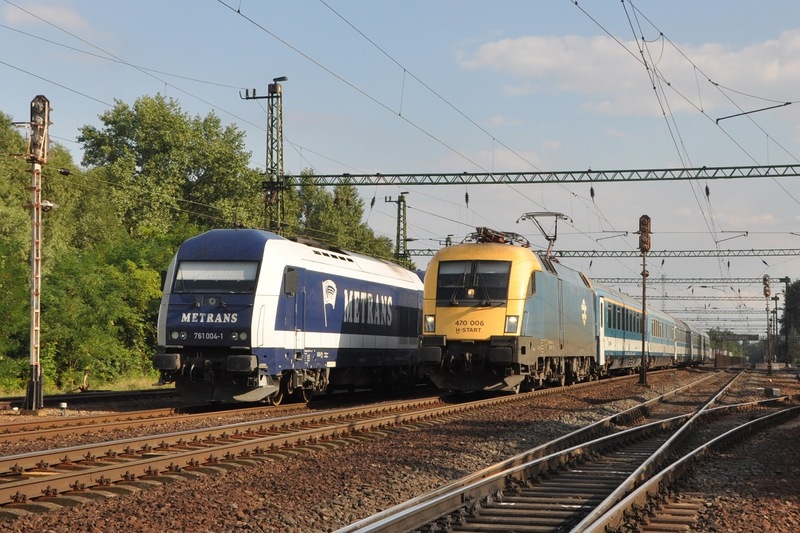 The M62 was replaced, as planned, at Szabadbattyan for 431 285 for the run onward to Budapest Deli. The replacement presumably happening here as Szekesfehervar is a complete building site! A slightly more leisurely day starting with a photo of the Nohab (on time to day) and a few electrics from a foot crossing between Budapest Deli and Kelenfold. Next up was a trip to the Budapest railway museum. Getting there was a bit of a farce... we headed to Nyugati for the 'scheduled local train' as stated on the website- only to find that this doesn't run anymore. No problem the nice info lady directed us to a trolleybus... that didn't go anywhere near the museum we were looking for! Cheers! 2 hours late we joined the 30 minute queue(!) to get into the museum. There was some sort of event on with small children everywhere and an intensive service on the 'garden railway'. Steam locomotives line up around the turntable at the Budapest railway museum. We didn't bother paying for a ride on the model lawnmower-driven Nohab as we concluded the one we had had the day before was probably better! Riding on the turntable was free though... so that had to be done. I have to hand it to the museum, while it was a hellish day to turn up and get a few photos of the locos, they were definitely spot on for the family day out and getting kids interested. We headed back to Kelenfold with 470 005. Here we were able to catch 630 006 LE and 630 040 with a fright while 418 331 was seen with an evening train to Tapolca. 628 230 around the turntable at Ferencvaros depot, Budapest. After the successful visit 431 537 was our chariot on to Kibanya Kispest before enjoying some heritage soviet metro action on line 3. 628 165 awaits its next duty in the shed at Ferencvaros. Sopron and Szombathely. Note the Gysev coaches. Disaster are supposed to come in threes? Well this morning got off to an impressively bad start. Having left my companions to fly home from Budapest I had decided to head out early to cover the Ludmilla on the Keszsthely turn otherwise I would regret it. The only way to get there was an early start on a RailJet from Keleti to Gyor, then down to Celldoemoelk. All was going there, the RailJet was in the platform, but there was some confusion whey I tried to buy my reservation for the 07:24 to Gyor... a reservation ultimately in hand I returned to the concourse to discover the train had gone- Oh no! It's 07:24 from Kelenfold!!! A little cursing and an aborted idea to chase the train across Budapest using Metro Line 4 (it would never have worked) and that was the day's plan in the bin before 07:30. I made my way to Gyor instead behind 480 017 and headed to Csorna just in case any Ludmillas were still lurking here- they weren't. Back to Gyor 430 325 to then work out a plan to meet EC245 the 'Citadella' to get into Solvenia. There were three options, via Csorna and Szombathely, via Celldoemoelk, or straight down to Veszprem. When 418 204 was seen ready to go with the 11:47 to Veszprem the decision was made as I had covered very little of this line before. The journey is very slow (I did worry shortly after leaving Gyor when a road sign showed 69km to Veszprem- it was going to take 2 hours to do 69km!!?) but some sections, particularly the southern half of the journey are very scenic. Former Gysev loco 418 204 pauses at Zirc while working the 11:47 Gyor - Veszprem. now haul the train noisily through to Pragersko, Slovenia. It should have been just over an hour wait at Veszprem for the Citadella... but at it's booked time the train was nowhere to be seen, and the platform had only two other people on it. I began to get worried- I did need to be in Ljubliana that night in order to make my flight home the next day! Time ticked by and there was very little information, just an occasional announcement of which all I could make out was 'Euro City' 'Citadella'- what they were saying about it I did not know! Around 35 minutes late I was relieved to see the train pull in behind 431 314 and I nabbed myself a compartment at the back of the train. Despite some an efficient run round at Zalaegerszeg we had lost more time in loops waiting to pass trains and arrived at Hodos some 50 minutes late. I had been worrying about the next bit for several days- a lot rested on what was going to take us forward to Pragersko- had I come all this way to bowled out by a silent 645? No. There was only one loco at Hodos and that could have taken us forward and it was 664 104. Panic over I spent the next two hours listening to this monster of a loco- certainly one of the loudest diesels I have traveled behind. Not sure I'd say it was the nicest sounding (I'm not sure it was supposed to be making a noise like screeching tires?! ), but certainly loud! As others have said much of the electrification is at an advanced stage, but there are still the occasional gaps and a lot of the OHLE is yet to receive wires of any sort. I'm sure it'll be done before the Great Western! By the time we said goodbye to the Reagan at Pragersko it was almost dark, a shame as the next leg of the journey with 342 014 looked like it could have been very scenic. It was a bit of a stagger to reach Ljubljana where we arrived 55 minutes late. Not time for much this morning before my Wizz flight back to Luton. A quick wander round Ljubljana which looks to be a lovely town and 20 minutes at the station which seemed to be very busy. 661 032 and 664 014 were both seen stabled. The amount of graffiti on the multiple units out here is appalling. Another excellent whistle-stop trip. Thanks to Rob, Rabbit and Matt for the company. After two very hurried trips I feel I've still barely touched the surface of the Czeck Republic, or Slovakia for that matter- A longer trip in its own right is definitely required. Hungary never disappoints and it was great to get a ride behind an M62 out there and to have such good, and unplanned luck with the M41's. I will be back for more- and maybe one day I'll manage to find an ex-British FLOYD loco working!? I hardly feel like I saw Slovenia- so that's another one to add to the list to come back to- though I suspect the Citadella will have gone electric before I am able to. M41 passes M62 at Balatonkenese, one of many passing loops on the railway to the north of lake Balaton.